Camshafts setting/locking tool – Jaguar No.303-530. Timing chain tensioning tool – Jaguar No.303-532. Crankshaft positioning tool – Jaguar No.303-645. Primary chain wedges – Jaguar No.303-533. Crankshaft pulley locking tool – Jaguar No.303-191. Crankshaft pulley remover – Jaguar No.303-588. Crankshaft pulley locking tool adapter – Jaguar No.303-191-02. If fitted: Mark position of crankshaft position (CKP) sensor before removal. WARNING: Do not use crankshaft positioning tool to remove/install crankshaft pulley. Remove crankshaft position (CKP) sensor from torque converter housing. Turn the crankshaft to align slot for crankshaft positioning tool  . Ensure that flats on RH camshafts are positioned upwards, if not turn crankshaft 360°. Fit crankshaft positioning tool  .NOTE: Ensure that the positioning tool engages with the slot in the trigger-ring. If fitted: Remove camshaft position actuators and carriers from cylinder heads  &  . Fit RH camshafts setting/locking tool  . Remove RH timing chain tensioner, rail and guide  ,  &  . Remove RH camshaft coupling chain tensioner  . Slacken RH exhaust camshaft sprocket bolt  . Slacken RH intake camshaft sprocket bolt  . Remove RH camshaft coupling chain and sprockets. Remove RH camshafts setting/locking tool  . Fit LH camshafts setting/locking tool  . Remove LH timing chain tensioner, rail and guide  ,  &  . Remove LH camshaft coupling chain tensioner  . Slacken LH exhaust camshaft sprocket bolt  . Slacken LH intake camshaft sprocket bolt  . Remove LH camshaft coupling chain and sprockets. WARNING: Ensure that crankshaft sprockets are installed correctly . Ensure crankshaft positioning tool is installed  . Ensure LH camshafts setting/locking tool is installed  . Fit LH camshaft coupling chain tensioner  . Fit LH camshaft coupling chain and sprockets. Do not tighten bolts. 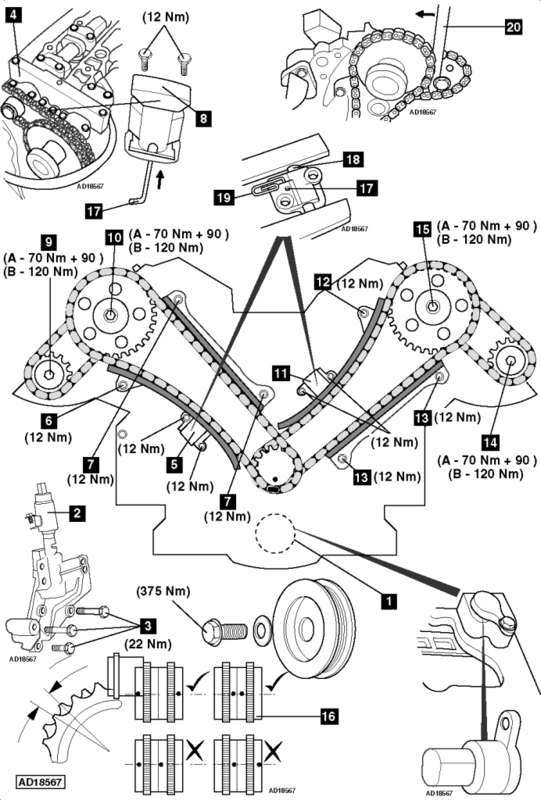 Fit LH timing chain, tensioner rail and guide  &  . Retain in position with wire clip  . Hold timing chain tensioning tool. Tension LH exhaust camshaft sprocket anti-clockwise  . XKR/XK8: (A) – 70 Nm + 90°. S-Type/XJR/XJ8: (B) – 120 Nm. Ensure RH camshafts setting/locking tool is installed  . Fit RH camshaft coupling chain tensioner  . Fit RH camshaft coupling chain and sprockets. Do not tighten bolts. Fit RH timing chain, tensioner rail and guide  &  . Hold timing chain tensioning tool. Tension RH exhaust camshaft sprocket anti-clockwise  . Remove LH and RH camshafts setting/locking tools  . If fitted: Fit camshaft position actuators  and carriers  to cylinder heads. Fit crankshaft pulley. Use new bolt.